Reason number three: You don’t actually have to read anything because teachers will lead class activities and discussions and you can just find out what things mean then. Dumb. Though, now that I say this, it is actually only partially dumb because it does save more time for thinking about girl kissing and talking with friends about same-said-kissing-of-girls. So half dumb, half cool. Reading is Dumb. There, I said it! by Chris Lehman. When I was in high school (1986-1991) I was relatively bored. I did what was expected of me, I learned the tricks, I jumped the hoops, and I handed in my work. By today’s standards I achieved a consistent and satisfying level 3 all of the time. In fact, when my mother asked me why I wasn’t achieving what she knew I could (‘As’ at that point in time), I mentioned that I had no real desire to do so, I had other interests that needed time as well: comic books, wrestling, model cars, and girls). I was happy with 75% – nothing else was necessary. I particularly wasn’t fond of English (although I fondly and with great admiration remember Mr. Milner as one of the most amazing teachers I have ever had. If anyone inspired me in retrospect – certainly not at the time – to become a teacher – it was him. He was a great teacher – but I wouldn’t say I was particularly engaged. The books bored me. I read plenty on my own time – and I mean plenty – I used to read a Hardy Boys book a week at one point. I also read about 35-40 comic books a week. I read. A lot. But I hated English class. I had no interest in the Stone Angel (or anything by Margaret Lawrence for that matter, could not relate with Romeo and Juliet (loved the movie though – every boy did – Olivia Hussey <<hint, hint>>), had no idea what was going on in King Lear, and thought To Kill a Mockingbird was passé. I barely read anything in class. I, too, learned that I didn’t really have to. As Chris mentions in his post, “… teachers will lead class activities and discussions and you can just find out what things mean then. Dumb.” Yup. I learned and could regurgitate everything I needed to and get that coveted 75%. I was good. I was happy. I had time for other things I cared about. The universe continued. I graduated and moved on to get a diploma in graphic design worked in the field for a few years, moved on to university and earned two honours bachelor degrees in 6 years (Anthropology and Classics) and moved on to earn a Masters Degree in Classics / Classical Archaeology. All while maintaining a 90+ percent average. When I was engaged I thrived – when I wasn’t I coasted. I did what I needed to do. When I was engaged, I did more – I wanted to do more – I couldn’t get enough. I loved, and LOVE LEARNING to this day. I just didn’t like school. It was boring. I was not intellectually engaged. I’m thinking now of a crowning achievement for me in academics. To this day, I am amazingly proud of this essay for which I won first place in the Classical Association of Canada Essay Writing Contest: Representations of Women on Classical Athenian Grave Stelai. 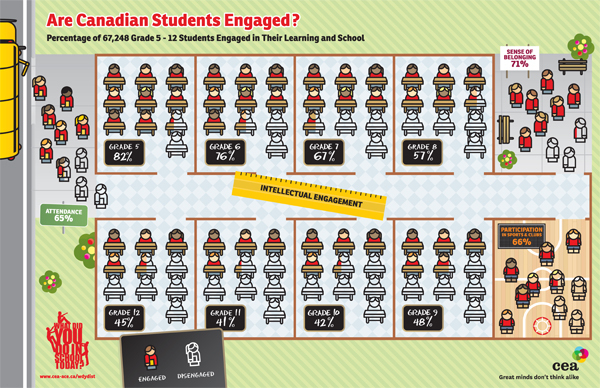 Whenever I hear talk of student engagement I wonder what the problem is. I doubt that it’s the students, their role possibly — but not them personally. I don’t buy into the idea that most of our students are lazy or incompetent. Instead, I think they’re bored. Every student I’ve taught could learn, just often not the same thing, or in the same way. And when I’ve asked my students about it, I’ve always found they love to learn; they just don’t like school. The Problem with Student Engagement, by Shelley Wright. But it certainly doesn’t have to be. And this is why I jumped at the opportunity to be a Student Engagement consultant – a role I currently and continue to hold at this point in my career. On the very first day I stepped into my classroom as a teacher I couldn’t help but be taken back to that boring world I used to habitate. It was the same. Books were the same. Teaching practice was the same. It was all the same. How on earth could I teach kids the same way I was when I knew full well that it was uninteresting and unengaging. I couldn’t do it. I had to be different. My classroom would be different. I would learn what students needed, I would support them with it, I would stretch their minds, I would give them something to enjoy. Did it work? Nope. At least not right away. Why? It din’t work because they weren’t accustomed to it. They were trained the “other way”, they knew what to do, they knew what to say, they knew how to play the game. But then I came along. And I changed the rules. They didn’t know what to do anymore. They didn’t know where the hoop was to jump through it. They had to find the hoop and then figure out what to do with it themselves. I didn’t give them the answers to books in discussion, I made them find material (anyway they wanted to) and present it back to me – and then I still wouldn’t tell them what was right or not. I loved it when they came up with new things I never had. I loved it when they presented something out of the ordinary or even the conventional for that matter. Did they like it. Nope. Why? They didn’t take to it right away because they wanted the “right” answer. I told them there wasn’t one. That many scholars would argue and ofttimes could not agree. I validated their opinion. They could not be wrong – they just had to justify, rationalize, and explain why they believed what they did. They would converse with each other, explore together, and take risks. In time, their reflections were off the charts. It took time – but it worked. He grew to know my interests my strengths and what would interest me intellectually. I’t wasn’t the same thing everybody else was doing and that’s the point. People don’t all want to learn the same things and they don’t learn them the same ways. Our job as teachers is to find that spark, ignite it, and feed it until that passion is a raging inferno that cannot be contained. For me, engagement is a genuine disposition for self-directed, deep learning, fostered from an early age and continues life long. That’s the point of engagement, not to coherse kids into performing the tasks we want them to do. Time on task is not engagement. The completion of a task does not indicate engagement. As I mentioned earlier. I completed my work. I was not engaged. I mentioned earlier that teachers can spark learning and provide the kindling to awaken the inferno that is a true to desire to learn about things students want to learn about, in ways they want to learn about them, and then express themselves in the variety of ways that make them an individuals in a sea of individuals. For me, that kindling has been digital tools and blogging. You will find within the layers of my blog a deep passion for both innovation in education, a reformation of the norm, and providing students with outlets to express their voice. I refused for my learning environment to be the one I endured almost 30 years ago (yikes). I had to be different. It had to incorporate the tools of today. It had to provide students with authenticity and relevance that they could easily translate to other courses and their daily lives. I outfitted that space at my own expense. I purchased an LCD projector that I could incorporate into my learning everyday. I purchased a second laptop, a set of speakers, and a plethora of tools that I knew was a worthwhile investment both for student learning and for my own pedagogical practice In support of my wife doing the same, I purchased 8 refurbished desktops, a kit of mp3 players and some refurbished Android tablets so that she too could incorporate a variety of digital tools and outlets into the learning experiences of her students. It was worth the investment The payouts in student engagement were huge! By providing the tools to be used at the point of instruction, students were able to explore and discover immediately without being hampered by the need for booking a computer lab. Everything was at the ready when it was needed and when it mattered the most. We need to listen to our students, we need to honour their differences, we need to provide them with the learning opportunities they crave, and we need to differentiate for them. How can we help everyone feel like they are being treated fairly? What makes you want to come to school? How can we help you achieve in school? What does it mean to you to have more programs to choose from in your school? Here is a sampling of what students said at the West Cluster held at Highland Secondary School on October 19th, 2012. You’ll notice that the students refer to topics specifically that could be referred to as Institutional or Social Engagement. Intellectual engagement is a difficult component to nail down. Are students able to articulate how they can be intellectually engaged? Can any of us? So, I turn it over to you…. What do you do to engage your students intellectually? Wow – you said a lot! I definitely agree that many of our students are intellectually engaged, which is why I loved Chris Lehman’s post. We are stuck in a “just tell me how to do it right” mentality, in every part of education, from system leaders, to principals, to teachers and to students. The question for me is how to break that and not just pay lip service to critical thinking and innovation. I definitely agree, Sue. It is easy to talk about innovation and critical thinking skills supported by concepts such as 21st Century Learning but “walking the walk” is another matter. Every teaching strategy doesn’t engage every student either. Finding the right strategy for every student is no easy task – and seemingly impossible for some. I do, however, intrinsically believe that every student can be engaged and every student wants to learn. Students will tell us if we ask them and truly listen. That may indeed be the key. Aaron, I absolutely LOVE this post of yours! You’ve given me so much to think about. I can’t help but think back to September of this year when my teaching partner and I had our Grade 6 students look at the curriculum expectations to create their own literacy centres. They couldn’t believe that the choice was theirs. Students kept looking for a right or wrong answer of what to create, and we didn’t have one. It took the students a long time to get used to this change, and some students are still adjusting. I’ll never forget the lovely comment that a parent made on one of my blog posts earlier this year. Her daughter was worried about what she would think of my “technology classroom,” but she came home so excited about school because it, “wasn’t about technology. It was about student choice.” I love that! Students should be engaged in the classroom, and it’s educators like you that have inspired me to make important changes in my classroom to make learning always about the students first. I’ll never forget your ECOO presentation (the one you did with Jenn) on THE HOOD. After leaving your session, I went back to my school and changed things around to give students more choice. You two brought about an important change. I don’t know how we get more people to see presentations like yours, but I think it’s important that they do. Thinking about your Student Voice Forums even, I wonder, how do we get to the next step? How do we bring about these bigger changes? What would you suggest? Aaron, I absolutely LOVED this blog post of yours. I can’t help but think back to an activity that my teaching partner and I did back in September with our Grade 6’s. We gave the students the curriculum expectations, and had them create their own literacy centres. Many students struggled when we told them that there wasn’t a right or wrong answer. It’s almost like they needed to know that their ideas were good enough. Not long after doing this, I blogged about the experience, and I’ll never forget the comment left by one of the parents. She said that her daughter was initially nervous about being in a “technology classroom,” but then she came home from school and told her parents how excited she was about all of the student choice. She said that it wasn’t all about technology, but instead about choice. I love that! Learning should be engaging, and students should have a voice in this learning. I’ll never forget the presentation that you and Jen did at ECOO on The ‘Hood. You helped me see just what a classroom can look like, and just how much student voice there can be in any classroom (from Kindergarten to Grade 12 and beyond). I went back to school after your presentation and made important changes in my classroom (i.e., giving more choice at centres, having students involved in creating activities, etc. ), and for that, I thank you. Keeping this in mind and then thinking about the Student Voice Forums, I can’t help but wonder, where do we go next? How do we take what students are saying and make these changes in our Board and other Boards? What do you think is the best first step? Thanks for always getting me thinking, Aaron! As educators we must facilitate a transition of school dynamics to include an increase in student learning and engagement through student voice and choice. Classroom and homework tasks must have a clear academic purpose, be efficient, allow for or foster student ownership, and leave the student with a feeling of competence. Providing students opportunities to become actively engaged in their learning helps bring about meaningful work and the development of lifelong learners. Besides the opportunity to read the article, “Reading is Dumb”, the biggest thing that jumped out at me was your job title: Student Engagement consultant. How inspiring that a job such as that exists out there, but disappointing that it’s not the title of every teacher in a classroom. As a principal, I would seek out the wisdom of such a consultant, as I could see its implications being lasting in a school community. Schools will continue to seek outside support in engaging students because so many teachers gravitate to teaching the way they were taught. If they sought out the wisdom of the students they are teaching – tapping into their voice and choice, as comments above suggest – then the engagement would come all the more easily.